From our Chinese Polychrome Collection, a beautiful pair of pith paintings, circa 1840-1860, each representing a lady of high stature, possibly royalty, being attended to by her servant. 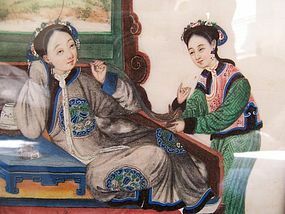 One is reclining upon an opium bed with a large screen while her servant lights her pipe; the second sits upon a throne in a dragon embossed robe, also backed by a large and well-painted screen, and is being presented a ruyi scepter by her servant. Both pieces are extremely well-painted and represent very fine examples of this genre. Please draw your attention to the realism of the faces, and the fine details of their garments. As is often the case with high quality examples, and due to the unique cellular structure of pith itself, the gouache (paint) sometimes seem to "float" with a three-dimensional quality on the surface of the piece. This is most apparent in the image with the lady on the throne, where the embroidered details of her dragon robe have a wonderful depth and three-dimensionality to them. It's difficult to capture this aspect in mere internet photographs, but it is readily discernible in person, and quite a lovely phenomenon to see. It is generally recognized that paintings on pith paper began in the 1820's and continued up until the late 19th / early 20th century, with the heyday of this art form being the middle 19th century. The emergence of this art form sprang from demand for smaller, more portable examples of Chinese art as an alternative to the larger Canton Trade oil paintings that were more cumbersome to export. Pith paintings were often produced in small albums with numerous paintings per album, and these made for easy convenient transport. Enclosure within an album also had the added advantage of preserving the gouache (paint) from being degraded by exposure to light. Indeed, most of the surviving examples seen today actually once belonged to albums, and have since been removed and mounted as individual pieces. Individual artists rarely signed their own works, and one of the few known to have done so was an artist named Sunqua. Pith is an organic material, harvested from a shrub native to southwest China. Its preparation for use as a painting medium is actually a highly skilled, labor intensive process, almost an art form in itself. It involves coring the shrub for its raw material, then slicing it into extremely fine sheets and drying it. The result is a very spongy surface that helps yield the three-dimensional / textured phenomenon discussed above. Due to the nature of the pith itself, namely, the difficulty in being able to slice large sheets that can retain their structural integrity and not fall apart, pith paintings are generally small by necessity. These examples are close to the generally accepted maximum size. Size and Condition: Framed dimensions: 13 inches long, 8 1/4 inches wide. Unframed dimensions: 12 inches long, 7 1/2 inches wide. The piece with the lady on the opium bed is in excellent condition with only some slight soiling / yellowing to the unpainted areas, commensurate with age. The piece with the lady on the throne is also in excellent condition with similar soiling / yellowing to the unpainted areas, but there is also a small area on the upper left that appears rough-edged. This probably occurred when it was originally removed from its album. Hardly significant but we mention it for accuracy and completeness. The frames of each piece are scuffed a bit too, as they appear to be rather old themselves, but this is all part of the charm of these pieces.